Put a ____ on it! Put a crosswalk on it! 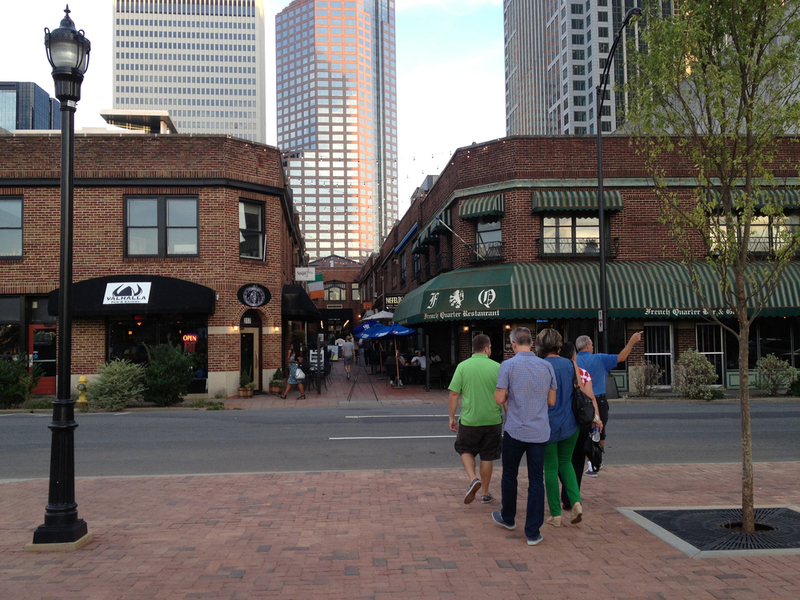 Before: No formal crossing from Romare Bearden Park to Latta Arcade. Romare Bearden Park just opened in late August 2013. It's a much needed public open space for Uptown. There are, however, a few more opportunities that could dramatically improve the park's access. Traffic on Church Street is one way, and it moves fast. Vehicles need to start learning to slow down on this block where restaurants, bars, and other shops pull visitors from the park, and vice versa. There should be a mid-block crossing to formalize, and make safer, this relationship. After: with raised crosswalk to enhance the connection between Latta Arcade and the park. Like Complete Blocks on Facebook! Our inspirational phrase for simple additions to make life better. Now cyclists and walkers feel safer with more distance from the fast moving traffic. Add to our map below. For easy instructions see this super short video (there is no sound). 29 | Put a curb cut and crosswalk on it! 28 | Put a Park and Transit on it! 27 | Put a Bike Corral on it! 26 | Put Polka Dots on it! 23 | Public Fridge Poetry! Tools used to make the fix! Click to see the tool in action. Add a place you'd like to see changed. Silent video: See this super short video for easy instructions to add your idea.